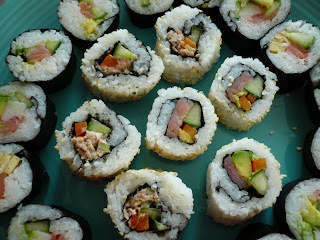 I made another round of sushi last week. I am too lazy to cook in this hot weather. It look so much better this time, isn't it. 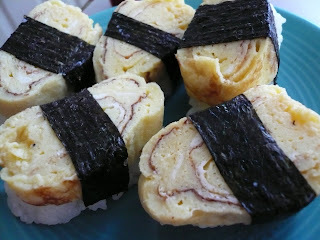 I made some Tamago sushi too. Zue, Tamago is Japanese word for 'Egg' so is basically omelette with soy sauce, mirin and sugar in it. 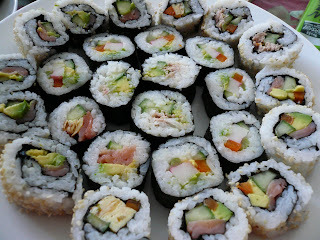 Mmmmm....sushi, my fav food!! Can't live without it. 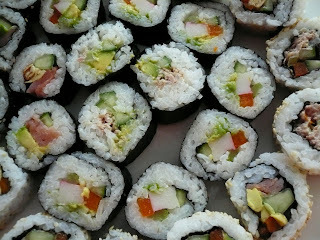 Nice blog with simple recipes. Looks easy enough to want to try out. Thanks! !